Since Paul Krugman is talking about the 150th anniversary of the U.S. Civil War outbreak, it is worth recalling the great monetary experiments created by the Civil War. This great event resulted in the establishment of three monetary regions in the United States: the Greenback monetary system, the Yellowback monetary system, and the Confederate monetary system. Between 1862 and 1865, the price level rose about 60% because of excessive issuance of greenbacks. 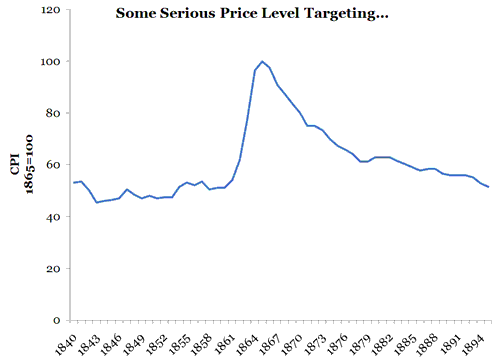 Over the next thirty years, the price level decline by almost 50% due a to a desire to return to the gold standard by 1879. Doing so required either retiring the greenbacks (done initially) or freezing the stock of greenbacks (done later) and allowing the economy to grow into them. Once the gold standard was resumed, the price level continued to fall as the growth in gold was slower than the growth of the economy. 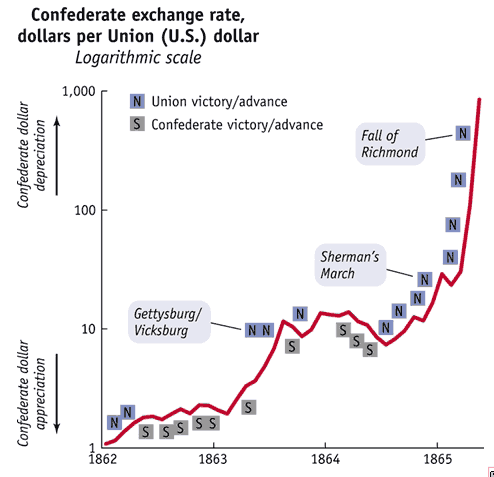 Eventually, the price level was about where it was prior to the Civil War. Fortunately, this 30 year run of falling prices was associated with on average rapid real growth, rising real wages, and increasing financial intermediation as noted here. [F]rom 1865 to 1879, when the greenback currency became convertible into gold we have a monetary rarity: a strong political union, untouched by war, with two currencies, greenbacks and yellowbacks, circulating at a floating exchange rate. Though there were other important monetary changes during Civil War like the introduction of the flawed National Banking System, the three monetary system that emerged during the Civil War was truly a remarkable development.